I get asked about this a lot, for some reason. Probably because I bring it up a lot. For some reason, the congee really agreed with my digestive system in the morning and I’ve been having it since. Except on weekends when I go full English. Bacon. It’s a hell of a drug. Before the beginning of your week (Sunday, for me), put the rice, miso paste, ginger and water in a slow cooker on high. I do this before bed so that it runs at a low simmer for 8 hours. You can adjust the rice level depending on how thick you like your congee, and the miso level depending on how strong a flavour you like. Once the rice has turned to mush, this is done. You should now have 5 cups of congee: 1 cup for every morning. Put this in the fridge, it’ll last the week. Every morning, I microwave 1 cup of congee in a big bowl for 2 minutes. Make sure it’s a big bowl and that you cover it with a microwave cover. This WILL bubble up and mess up your entire microwave. Not ideal for a busy morning. 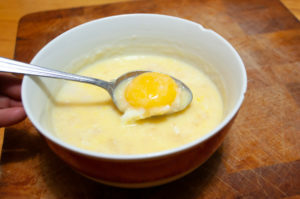 If you’re not using eggs, you can heat your protein up along with the congee for however long it takes your microwave to heat the food through. *Note: Miso paste keeps forever in your fridge, so don’t be scared of buying a tub of it. I go through one every few months. As for ginger, I’ll buy a large knob, peel it and cut it into slices that keep very nicely in a freezer bag in my freezer.